To Robe Or Not To Robe, That Is The Question? 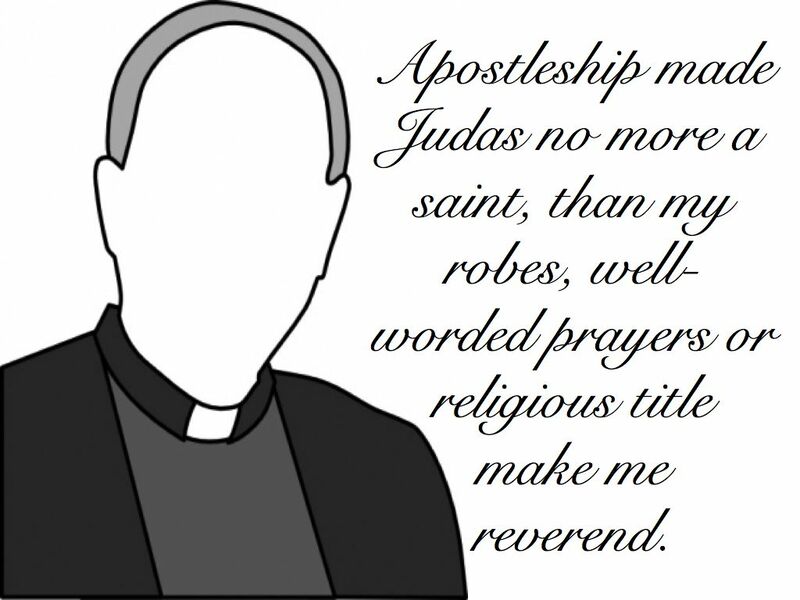 Apostleship made Judas no more a saint, than my robes, well-worded prayers or religious title make me reverend. Should I hang up my clergy robes in favour of jeans and an open necked shirt then? I was in conversation with a Lay Reader of an Anglo-Catholic church recently who was defending the tradition of wearing his black cassock whilst going about his daily church visiting. There are many fewer such ministers still wearing their traditional clergy robes outside Sunday services; indeed my Training Vicar/Incumbent would rarely be seen wearing robes or even a dog-collar at all! Religious regalia such as clergy robes are dismissed by many as form of outdated irrelevant "power dressing" that do more to spread class division than spread the gospel. Theologian Rev Andrew Atherstone a tutor at Wycliffe Hall, Oxford University writes "The existing law, which makes robes obligatory for all, belongs to a bygone world. In the 21st century Anglican ministers must at last be given the freedom to decide their own clothing, in consultation with their congregations, based on their local setting." The wearing of robes, which we have the Romans to thank for, is part of church law in which we find the half century old Canon B8 itself based on earlier rules from 1604. The Church of England interprets that "the requirements of the Church of England's Canons are not onerous. They simply state that at celebrations of Holy Communion, Occasional Offices (such as weddings) and, on Sundays, the statutory services of Morning and Evening Prayer, the presiding minister should normally wear a surplice or alb (essentially a single simple robe) with scarf or stole." But Rev Jeffrey J. Meyer builds on the case for robes. He believes that robes help to hide the personality of the minister whilst encouraging others to place recognition and professional confidence in their special calling; just as you would a uniformed and qualified professional such as a policeman or nurse. A 'freelance' funeral minister with no professional theological training can legally dupe the general public simply by wearing robes - their professional credibility is assumed. Meyer would continue that it's far easier to receive ministry from a younger minister who has become our friend if instead of taking a loved ones funeral in jeans and a t-shirt, they are robed as God’s appointed minister, leading us into God’s presence and speaking God’s word to us. It becomes less about the personality of the minister and more about the robe of office which they happen to be filling whilst adding dignity and reverence to the service. A further point is that a minister is acting not for herself but for Jesus, representing Him under His authority. And what of our motive? In our attempt to move with the times and be relevant to those we service are we in danger of allowing the world to be our paymaster rather than The Lord? How long before my title is changed to Executive Director of Worship and Pastoral Care in our attempt to fit in with what the world recognises? But through this I am still left unconvinced on the case for robes. Ultimately we should be shaped by scripture more than tradition. In scripture I see no clear word on any church leader wearing special robes. Did Jesus robe? He might have worn them but only in donning the cultural norm. If people struggle to associate with me as an unrobed leader; surely that should challenge me about my Christian integrity, not force me to wear robes to disguise my failed unsuitable personality. Jesus and his disciples never wore fancy regalia, surely because it would just place them on a higher pedestal than others; which isn't the message of the gospel. Today we are all a chosen priesthood, God shows no partiality. Indeed look at the attitude of Jesus to those who though they deserved partiality such as the robed up Pharisees. I concede that there are inner-city Anglo Catholic churches growing because for some folk seeking God there is a draw towards the awe, reverence and mystery that can be found in the ceremony of a Eucharistic Mass. Perhaps it works better for those who would prefer to relate to a transcendent God than one more immanent. Too strong a generalisation maybe as it is true too that both transcendence and immanence can be experienced as we relate to God regardless of high or low tradition. But in my experience and context I don't believe today that I would have courted so many community friendships with ordinary folk had I rode up and I went about doing parish business wearing a black cassock. Indeed when I first arrived, even wearing a dog-collar would prompt many to cross over to the otherside of the road. It's about genuine relationships without unhelpful barriers. Facebook has enabled people to see me for who I am; a common sinner, seeking the common good, for a common people for an Almighty God with an almighty plan and purpose for your life as part of His Almighty Kingdom.